Groups works exactly like ‘Show and Hide’ fields. This feature allows you to link fields together so that they appear or disappear together when a certain condition is met. By arranging the fields together you avoid having to set the same rules twice. 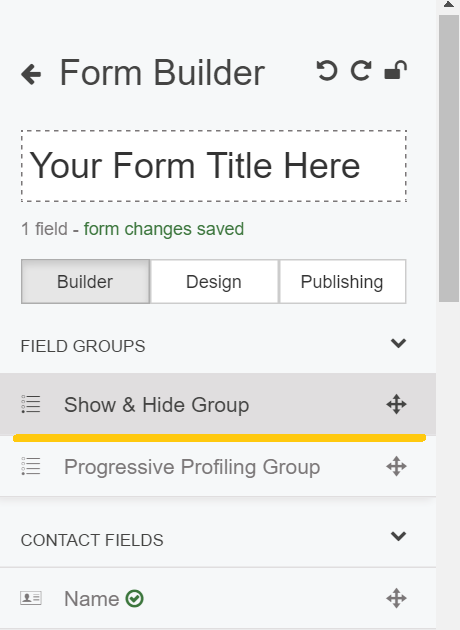 To use this feature simply drag ‘Show and Hide Group’ from the left-side panel into your form. Drag the questions you wish to be linked together into the Show and Hide Group and set the Group Rules the same way you would in ‘Show and Hide’.